For a bright collection of assorted Chinese Zodiac Sign images, Chinese characters, and many other colorful clip art designs, visit any link on this page. Click here to find a diverse TATTOO ART collection. 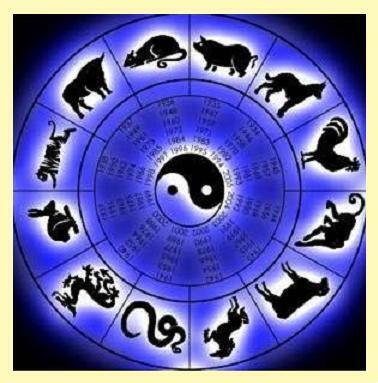 The Chinese Zodiac (also known as the Eastern Zodiac) is composed of twelve different animal symbols, each one representing a different personality type. The animals of the Chinese Zodiac are Rat, Ox Tiger, Rabbit (also known as Hare), Dragon, Snake, Horse, Ram (also known as Sheep or Goat), Monkey, Rooster, Dog and Pig (also known as Boar). This ever-expanding clip art collection represents some of the the most frequently searched images on the internet. Other clip art themes on this page include signs of the Western Zodiac, hearts, flames, fireworks and many more free printable clipart creations. Clip art refers to pre-made images (drawn by hand or created on a computer) that are used to illustrate any medium. Today's most popular clipart themes and images are holidays (Santas and turkeys), birthdays (cakes, candles and gifts), animals (especially horses, monkeys and dogs) and emoticons. To print any of these images, just right-click on any image, and select a SAVE option from your drop-down menu. This will save it to your picture file. From there, you can reduce or enlarge the image as needed, and print all the copies you want. These designs can be used to adorn your correspondence, to practice your drawing skills, or in just about any way you can imagine. Find Free Printable Car Insurance Stats for All 50 States and Washington DC.